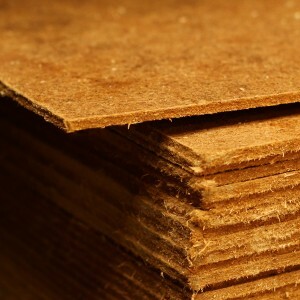 Also known as high-density fibreboard (HDF), hardboard is cheaper than other boards and sheet materials such as plywood. It is made from compressed wood pulp that has been exploded and given steam and heat applications for a very fine finish that is tough, yet very absorbent. Hardboard can have either two smooth sides, or one smooth side and one rough side. Tempered hardboard is coated with an oil film before being baked, this makes it stronger and more resistant to moisture. Hardboard does not have grain, though it can easily be given a veneer to gain the appearance of solid wood.